Denver! This weather be cray. But luckily there are plenty of distractions this week, including a bunch of pop-up markets, a bicycle scavenger hunt, comedy shows, art exhibits, a how-to in kombucha, roller skating jammy jams, classy yoga, 4/20 celebrations, and SO. MUCH. MORE. True story: this company will make you like dance performance, even if you think you don’t. For their most recent performance, Wonderbound is joined by Chimney Choir to bring you a new tale full of daring adventure, featuring over 25 new songs. Watch as the young hero departs his home to chase the girl of his dreams. Upon his arrival in Boomtown, he is sent hurtling through a series of mishaps and chance encounters that ultimately make him question what it was he wanted all along. Tickets start at $22. Go! FREE opening reception for Metropolitan State University’s Bachelor of Fine Art thesis exhibition. Come support these budding artists! Imbibe Denver is jumpstarting the 2015 Denver Flea season with an evening bash! With limited tickets available, the Flea Kick-Off Party will give guests the first chance to shop and meet 100+ vendors. Tickets include bottomless adult beverages, live music, a photobooth, surprise giveaways, and a chance to taste the custom-brewed ale, Fleak Out! Wild Ale. Come meet your ‘maker’ and kick off 2015 with the Denver Flea. Tickets start at $25. Lipgloss will start its new run at Syntax Physic Opera beginning on May 1st, but until then, come dance it out at Milk! One-night only! No cover! Oh my! Go directly to Roll! Do not pass go! Do not collect $200! Roll the dice, take a chance, and break the bank at the most money skating party in Denver! Prepare for a night filled with skating, drinking, dancing, karaoke, and ping-pong! FREE admission between 9 – 10pm and $5 afterwards (or get advance tickets, which include skate rental). This event is 21+; sign your waiver ahead of time and avoid the line! Spring is here and so is the spring #sourcepopup market. Sticking to the principal of good artisanship, the #sourcepopup is a curated market composed of vendors showcasing their talent. Come explore and take home goods from vendors such as Primary Ties, Sully & CO., Banshee Press, Jewelry by Colleen Heinemann, Kirstin Smith, Haiku Foods, Desserts by Lindsay Ragsdale, Gypsy Juice, and more. FREE entry. Honey Nest Mercantile is a unique vintage-inspired market. This event will bring together local vendors of vintage and high-quality handmade items, as well as vintage-inspired goods in a beautiful setting for all shoppers. There will also be food Trucks and a full bar with mimosas and bloodies on-site. Suggested door donation to benefit Champa House, a Curtis Park neighborhood shelter for women and children. Bring a friend and enjoy shopping locally! A celebration of the finest Colorado-made goods, beer, food, and more from your favorite local craftsmen and craftswomen! On April 18th, the cool kids at Imbibe will welcome the city back to Bindery on Blake to experience a hand-picked selection of local artisans, designers, and makers, along with vendors of vintage items, repurposed furniture, and other curiosities. RSVP in advance for a free brew and a chance to win a New Belgium cruiser bike. Remix (Young Professionals of the Colorado Symphony) presents CSOm, a special yoga workshop for all levels with live music from musicians of the Colorado Symphony Orchestra. Come experience yoga in a new way, while supporting the arts in your community! Register here ($15 – $25). Comedy and friendship, all wrapped into a sketch comedy show like no other! This month, Janae Burris and Timmi Lasley will be joined by the talents of JD Lopez and Bethany Hernandez to make you ROFL. Plus, tix be only 5 bucks, so come and be a part of the fun – friendsforeverdotcom. Do your best college-freshman-on-the-weekend impersonation and stumble on down to the Infinite Monkey Theorem for a Mediterranean buffet with paella, eggs, and chocolate croissants. Twenty bucks gets you a mimosa or a peach Bellini + unlimited brunch. Call to reserve your spot, purchase tickets here, or just show up. More info on this event here. Kombucha is super good for you and Hannah and Levi from Haiku Foods know all about it. They’ll take you through the whole brewing process, provide samples of brews in-progress and a variety of tasty flavors to try. By the end of this workshop, you’ll be a kombucha-making master with your own kombucha kit, including tea, sugar, and culture. Registration costs $40; drinks & snacks provided. Support your neighborhood bike shop! Scavenger hunt registration begins at 3pm. 1-3 people/team; $5/person to enter. Prizes for winners! Hunt starts at 4pm; after-party at 7pm with FREE beer, BBQ, and giveaways! Still not ready to say goodbye to the weekend? Well come check-out this FREE comedy show, featuring the likes of Meghan DePonceau, Zach Reinert, Aristotle Georgeson, Adrienne Airhart, Anthony Crawford, and headliner, Elliot Woolsey. Hosted by Greg Baumhauer. Plus, no metered parking on Sundays! Booyah. Give the middle finger to Monday and come out for some quality laughs and some quality brews. Debates this month include Going to Prom vs. Not Going to Prom, Boom vs. Bust, Cricket vs Baseball, Uptown vs. Downtown, and the headlining debate, Life vs. Death. FREE. 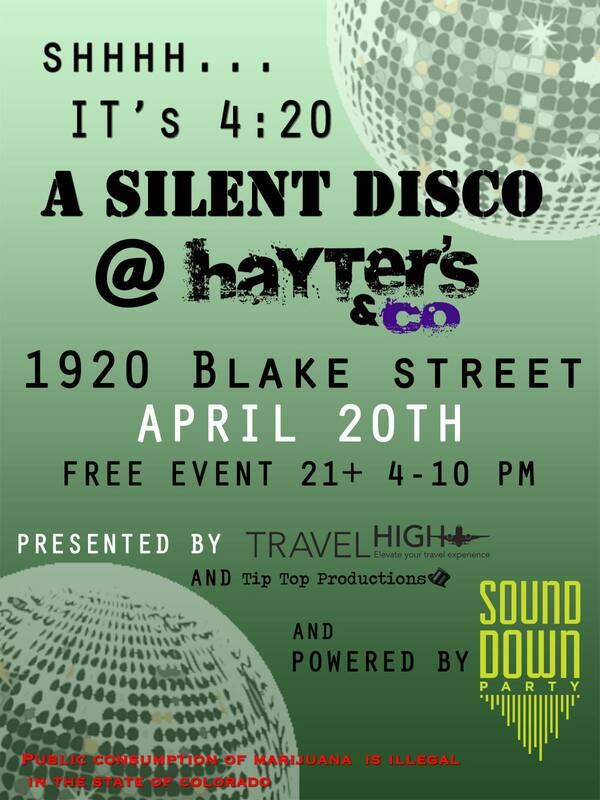 Monday, April 20, 2015 @ 4 – 10pm: 4/20 Silent Disco at Hayter’s & Co. Emergency dance party! Come celebrate 4/20 with SoundDown Party at this FREE silent disco dance party! Yay-uh! It’s back! Bigger, better, and more horrifying than ever! Well – it’s back anyway, and that’s a great thing, right? Join the Denver Film Society this Monday with your host (and birthday boy) Patrick Brown, as he re-kindles this weekly gathering of challenging pop culture questions, boozy trivia, prizes galore, and other goofy antics! Invite your friends; FREE. Food + comedy + video + live music = a 4/20 event that actually RULES. Performances from The Fine Gentleman’s Club, Brent Coles from You Me & Apollo, and Dragondeer, plus eps of Bong Appetit. Tickets are only $10! Party. Join Feed Denver on Tuesday, April 21st to watch Food Chain$, a new film exploring the Imokolee Food Workers’ fight for better conditions. They will also be showing the Lexicon of Sustainability show and film shorts. Drinks and snacks provided. FREE. The Great Debate pits teams of non-experts head-to-head, toe-to-toe, and often dumb-to-dumber in lively debates of the inconsequential. Mundane topics are brought to life by ordinary, but opinionated folks. You’re bound to be a flip-flopper after listening to compelling arguments on things that never mattered. This month’s theme? Hot Pockets vs. Kangaroos. Box office opens at 7:30pm, and the feud starts at 8pm. $5 – $8, depending on your luck, or reserve your spot ahead of time. Declaration Brewing is teaming up with the Art of War Project again for #DeclareYourArt! This is a chance to come have some beers while painting with the Art Of War instructors. The Art of War Project was founded to inspire hope and contribute to the health and well-being of American Veterans dealing with PTSD. By providing a positive outlet through art and other creative endeavors, they seek to make lives better. #DeclareYourArt is open to anyone who would like to participate; $10 per person. Please join Chapter Be and Share Denver for their April DIY Networking event…Do.Share.Be. This event is for anyone and everyone who has started a small business or is in the beginning stages/exploring the idea of starting one. Come meet others who are in the same position and learn from shared experiences. You’ll also get your creative juices flowing with a quick and fun DIY activity to keep that right brain active and engaged! Please RSVP for this event so the organizers know how many people to expect. FREE. This screening includes a special appearance by Bill Plympton! In a fateful bumper car collision, Jake and Ella meet and become the most loving couple in the long history of romance. But when a scheming “other” woman drives a wedge of jealousy into their perfect courtship, insecurity and hatred spell out an untimely fate. With only the help of a disgraced magician and his forbidden “soul machine”, Ella takes the form of Jake’s numerous lovers, desperately fighting through malfunction and deceit as they try to reclaim their destiny. Tickets for this film run $10 – $12. Join the ladies of Goldyn for a trunk show with Collina Strada. Meet the designer behind the line, Hillary Taymour, and shop her minimalist-chic collection of ready-to-wear and handbags. Distinguished by high-end construction and tailored shapes, each piece is sustainably handmade in NYC. This event is FREE and open to the public. On April 23rd, improv comes with life lessons; ancient cities spill their environmental secrets; and attendees find out if they could survive the apocalypse. Drinks and mingles start at 6:30pm, show starts at 7pm. Tickets are $5 in advance; $8 at the door.